Men should utter nothing for which they would not willingly be responsible through time and eternity. I am exhausted from watching the news today. A man walked up to a public event where a Member of Congress was meeting with constituents and he opened fire. He killed 6 people, including a child. The Member of Congress, Representative Gabrielle Giffords, is in critical condition after he shot her through the head. Others are wounded. The shooter is in custody. He appears to be quite disturbed. He may have an accomplice. This is all we know for sure. That and Sarah Palin deleted this graphic from her website along with a recent tweet with her signature line “Don’t retreat, reload”. I am sitting with my head in my hands because I am sad. I am afraid. Let me say outright that I hate guns. I oppose the very existence of handguns. They are tools meant for harming or killing human beings and they serve no other purpose than that. They should be relegated to history. No one, NO ONE, outside of law enforcement should ever lay hands on one. I wish they had never been invented. A friend of mine’s husband works in law enforcement and will not let his children have toys guns. Because he has guns and knows they are not toys. I think that is one of the smartest things I have ever heard. We cannot minimize the harm possible from guns. So, the situation at hand is this: a disturbed man got his hands on a tool for killing people and proceeded to use it to kill people. We do not know why. We may never know why. We can guess. He left a trail of cyber messages that bespeak an irrational set of disturbances over issues such as literacy and currency. He read a lot of political literature. Do I think this was a political crime? Yes. 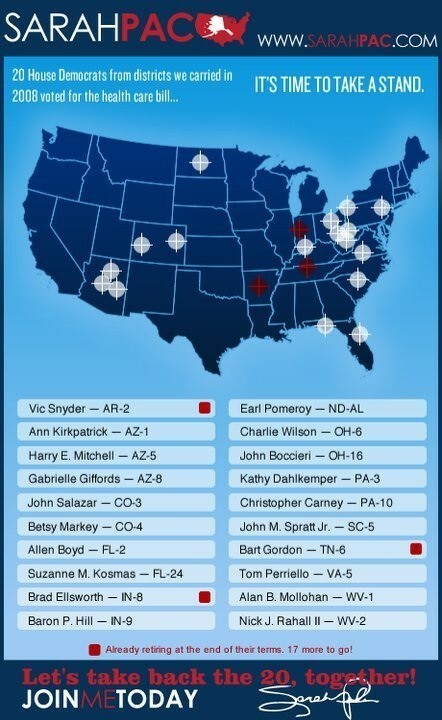 Do I think he targeted Giffords? Yes. Do I think he did it because Sarah Palin targeted her for electoral defeat? No. I think he targeted her because she was there. She was the face of the government in his neighborhood and he had a grudge against the government so he took down the closest representative. Why did he have a grudge against the government? Why did he not use usual channels to address it? Why did he not seek redress for grievances under the First Amendment? Why did he take up the arms allowed to him in the Second? Did he hear Sarah Palin tell people to reload? Did he take to heart Sharron Angle’s suggestion that “Second Amendment solutions” were a logical next step in the case of discontent? Does he believe the NRA’s rhetoric about every American’s need for a gun (and did he think they advertise such ideas out of a love for the Constitution more than out of a love for profits from gun sales)? Do the accusations of the illegitimacy of Obama’s presidency from those who believe he is not a natural-born citizen underpin this man’s distrust of the government? Does his obsession with a currency backed by gold hearken back to Glenn Beck’s relationship with the gold industry? Is his anger about improper use of English related to Lou Dobbs’ rants about immigration? Who gave this man his ideas? Sarah Palin is clearly afraid that someone will think she did. That’s why she removed the evidence that she likes gun imagery, imagery that makes guns sounds like toys, imagery that makes using guns seem acceptable. Imagery that is reported by the right and the left ad nauseum. Imagery that has become ubiquitous. Inescapable. Words…images…they have power. Words and images incited this man to violence and someday we may know which words and images were the ones to blame. But that won’t matter. It’s too late for the 9 year old who died today. It’s too late for the judge who died, for the man who worked for Gabrielle Giffords who died, or the three other unidentified victims. Just like it’s too late for the teen-agers who killed themselves after being tormented by bullies. Vile words have already taken their toll. Those words need to stop. Yes. You. Me. Not just Palin, and Beck, and Olbermann, and Limbaugh. You. Me. Stop it. Makes others stop it. You just can’t say some things out loud because you don’t know who is listening and how they’ll take your words. If you’re a parent, don’t wish ill on another if there’s a chance your child will hear it. If you’re a blogger, don’t wish ill on another if there’s a chance someone will read it. If you’re a television personality don’t wish ill on someone at all. Because you are speaking to disturbed people just by virtue of the size of your audience. You don’t not have the luxury of idle speech, And you certainly don’t have the luxury of carefully considered imagery that is riddled with violent undertones. It’s flatly irresponsible. Merely doing so should be enough to merit your removal from public discourse. If you are watching these people and they engage in detrimental speech, turn them off. Tune them out. Make them irrelevant. Because if we don’t, what next? A target on every public servant’s back? What about my husband, a government worker? Do we want him to be in danger? What about me, an advocacy professional? Should I live in fear that someone who opposes the causes for which I advocate will choose to end my work with a bullet? It has to stop. Please. Make it stop. I’m trying to think of an appropriate comment to this post and I can’t think of anything to add at all. Brilliant post. Violence or hate does nothing except breed more violence. I had blogger open to pen a blog post trying to sum up my feelings about today’s horrific shootings, and I didn’t even let it open all the way because of sudden doubts that I could be coherent enough to even warrant a post. I’m so disgusted and saddened. I can’t imagine what the families of all involved are feeling tonight, especially the parents of the nine year old girl who died. My first thought upon hearing that she was a vicitm was- Did they bring her to the event as a move toward her civics education?- because that sounds like something I would do with my kids. Dammit, it’s so freaking nonsensical. I’m so tired of it all. I’m so tired of getting worked up and having my heart race as I listen to NPR or read news online. I’m tired of feeling like there’s simply no way that our society will ever come together and talk like goddamn adults. So, I didn’t post, but so, so much of what you’ve said here has resonated with me. Enough with it all. Such a great post. I completely agree about toy guns. I don’t want them anywhere near us, and yet we live in a very conservative area where guns are a big deal, and I know my family will try to give them to my son simply because they know I hate them so much. Very well said. I will try to remember this for myself and my children. To be able to put in words this horrific and terrifying event so eloguently and heart-felt makes me want to meet you one day. I would hug you too. Hate and fear are what makes misunderstandings, and war. Some day I hope the world would be like the one that Gene Roddenbury envisioned for his “Star Trek” world. One World looking out for the best for humanity. Well said. I only wish that everyone could read this, take a moment, and teach their children the same. I agree with your thoughts on guns 100%, but it’s the message that the hate has to stop that is most important. Maybe those people would put down their guns if they weren’t encouraged. Yes. You. Me. We. All need to Stop! It does need to stop. Im lucky enough to live in a country where you are not allowed to own automatic or semi-automatic guns. You are not allowed to wear guns in public and yuo may not transport guns and ammo together and yet some people are still able to get access to weapons. They then use them and we are down another citizen. The need for the general public to carry fire arms is non-exisitant. Im for the removal of all fire power from the hands of the public. I feel the same way about guns but more to the point the rhetoric of hate is what inspires ppl to kill and we are all responsible for what we say and where we say it. I’m so sick of the right, the left, the media, reality tv idiots and yes, even bloggers of saying things for the pure purpose of getting attention. Excellent piece. I was glad to hear the Arizona sheriff get up there and bring this topic out in the open the way he did. I hope this will lead to a national movement to reject hate speech everywhere. But see, these right wing assholes don’t care. They don’t care if people get killed. It suits their purposes to have people scared. They can pretend all they like that they care, that they are just committed to a certain set of “values” but all one has to do is look behind them and see that the ones who own them, and who therefore ultimately control their messaging, work only to increase their $$$ and power. It’s disgusting. I can’t wrap my head around the mindset of people like the Koch brothers at all. Pingback: Mom-In-A-Million - Stop With The Violent Talk, Already!